Vedas are against the drinking of any alcohol considering it tamasic (ignorant, lethargic and destroying). One who seeks liberation should certainly avoid all kind of intoxication including coffee, tea and coffeinated drinks. See also “How food affects our mind.” If a person can’t give up drinking wine, an Ayurvedic doctor would advise what kind of wine is less injurious for his constitution. Hard alcohol isn’t good for anyone. Vata and Kapha might have small amount of dry white or red wine. Pitta can take small amounts of older, more mature red wines, for they are less acidic. 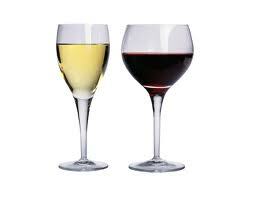 Cheap white wine is the most acidic type and should be avoided by all constitutions. Beer is better accepted by the Vata and Pitta types, as the yeast in beer can disturb the Kapha type. See detailed recommendations for your body – mind type in Food list for Vata, Pitta, and Kapha. The least amount of wine should be consumed in Pitta season (summer) when everyone’s Pitta tends to get aggravated by hot weather. Even if you live in an area where the summer isn’t hot, the increased time the sun is out aggravates Pitta anyway. Ayurveda is designed for ordinary people and has answers to all issues that might happen in our daily life. It knows how to deal with the overconsumption of alcohol and all that comes along with it. Headaches, dullness, inability to focus, nausea, dizziness and so on – are all symptoms of excess Pitta. Drinking too much alcohol aggravates Pitta in everyone, no matter what your leading dosha is. Eventually is damages the stomach and liver and can lead to serious illnesses. Drink a glass of warm water with 1 tsp lime juice, ½ tsp sugar, a pinch of salt, and ½ tsp baking soda added just before drinking. You will immediately feel much better. A glass of fresh orange juice with 1 tsp lime juice and a pinch of cumin powder can help with both an alcohol and drug – induced hangover. Lassi – blended diluted yogurt with a pinch of cumin powder will prevent dehydration, relieve nausea, and soothe the burning in your stomach (see detailed Lassi recipe). Drink 3-4 times in the day. Take ½ tsp of this mixture 2 or 3 times a day. Put it on your tongue, and wash down with warm water. Drink natural (not canned) coconut water. Nasya with bhringari oil or brahmi ghee may also be effective (see Nasya, Brahmi, Ghee). Tikta, an herbal compound, is an effective antidote for alcohol toxicity. Take ½ tsp of the powder 3 times a day if needed, washed down with warm water. TODAY’S TIP: After fixing the hangover ask yourself, whether it was worth it. Love the page and all of the information. I am a student of Ayurveda and am always looking for great resources like this page. Thank you for sharing it with us. I Subscribed and look forward to reading more. Where are you studying Ayurveda? Since I started incorporating Ayurveda into my life I began to understand myself, people around me, and the life in general so much better!